Historically Awesome | Some stories are too awesome for the history books. 1942 wasn’t a good year for the city of Stalingrad. The Nazi war machine was barreling through Russia in Operation Barbarossa, and it put capturing the strategically important city at the top of its priority list. Both sides threw everything they had at the city, and fighting soon degenerated to ferocious and bloody urban warfare. Into this mess stepped Red Army Sgt. Yakov Pavlov. 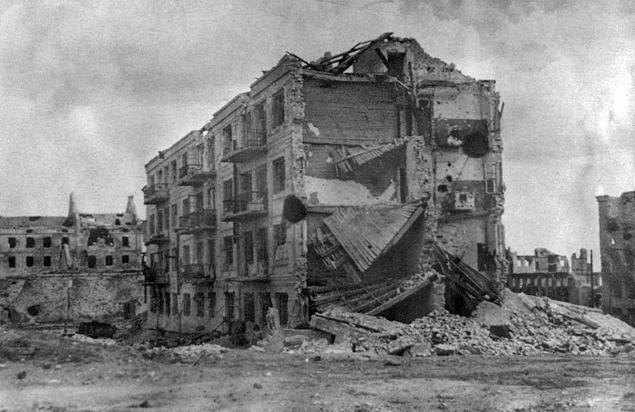 Leading a platoon of about 30 men, Pavlov was assigned to capture a bombed-out apartment building. Pavlov succeeded, but lost 26 of his own men in the process. Fortunately, reinforcements soon arrived in the form of 25 extra troops, barbed wire, machine guns, ammunition, and a PTRS-41 ANTI-TANK SNIPER rifle. Despite the extra help, Pavlov and his squad still faced daily maulings from German troops and armor. They now had control of the building, but how to defend it? The apartment’s four-story height and strategic position made it a prime sniping spot, so Pavlov’s solution was simple. After encircling the compound with four layers of razor wire, Pavlov simply stationed his men on all corners of the building and ordered them to give ’em Hell. Pavlov himself would use his PTRS-41 to destroy tanks from the apartment’s rooftop, often sharing the rooftop with truly legendary sharpshooter Anatoly Chekhov (more on him in a later article). With 30 men firing on the lower floors and the Sniper Team From Hell picking off targets from the roof, they quickly transformed the apartment into an “anti-Nazi death machine” that spewed hot lead onto the advancing Nazi hordes. The defenders held their makeshift redoubt for 13 months, until Soviet forces took back Stalingrad in November 1942. By the end of their siege, they had killed more Germans than Germans killed in the fight to take Paris. Pavlov was named a Hero of the Soviet Union, and the apartment they defended still stands to this day as a war monument.